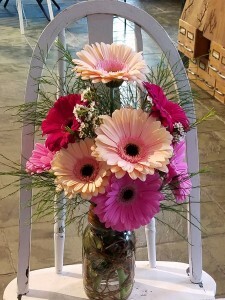 Qt Narrow Mouth Mason Jar, Screw On Lid, Assorted Gerber Daisies, Pieces Of Tree Fern, Pieces Of White Waxflower, Curly Willow & Ivy To Fill The Jar. Price # 1 - 6 piece box contains: Jack Daniels Single Barrel, Chambord & Amaretto Price# 2 - 12 Piece Box half pound box contains: Jack Daniels Single Barrel, Chambord, Jameson & Limoncello Ba Ter Liquor filled chocolates are made in Goldvein Virginia. Each chocolate is a masterful blend of liquor and sweet cream filling. This is a unique treat you do not want to miss out on. 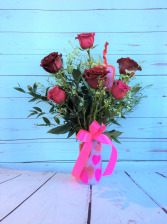 Rose Vase, Roses, Purple Alstro, Purple Monte, Salal, Ribbon. 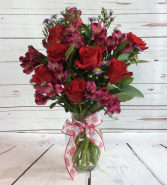 Italian Ruscus, White Wax, Hot Pink Rose, Red Roses, Poly Fill.